The trail is made up of mostly single track that is smooth and tight a great place to really put the pedal down and go. The terrain is mostly rolling hill type stuff so there really are no killer climbs out there. It's fast and twisty and is made up of about four different loops all of which give you a great scenic look at the lake and Crowley's Ridge. The loops are divided up into Beginner, Intermediate, Advanced and Expert so no matter what your skill level is I am sure you will find something out there to satisfy your palate. The trail is not overly rocky so the tech level is not really all that bad for this trail. If you are in the Jonesboro area you really should go check this trail out, and the Park is pretty cool as well. Review: You'll pretty much be the only rider out in Jonesboro NE Arkansas, which could be fun. While out here I had no idea where the trailhead was and just jumped in at what I think is mile marker 3 black...mostly due to using google to navigate into Craig Forest Park (which took me into the middle of the park where there's a playground with lake views and thru RV areas). However, I'm pretty sure the MTB trailhead starts at the intersection of Forest Park Dr and Forest Park Loop.. there is a mtb trail sign and map there (the only one for the whole trail system I think!) which I missed when I drove in. Anyway, the green trail is leisurely going around the outside of the lake's paved loop road. I only took this green trail and a little bit of the black trail which is fun. A new road was being built so it kind of threw me off about where the trails went. It looked like the new road had cut off the trail in some areas..which would would totally be unfortunate. Anyways, I felt a little sketchy about venturing out onto a few trails that looked untouched so I decided not to go since I was by myself... especially around the Northwest and Northeast areas of the lake. I did another lap around the green trail of the lake, and didn't realize there's more MTB trails INSIDE the paved loop road. I missed out. Anyway, I went into this trail blind not knowing where anything was and didn't see a trailhead map yet at the time so did some exploring instead. which was fun in itself. Wish I could've rode more of it had I known or had more info on where to go. Overall I definitely think it's a fun trail if knowing where to go wasn't an issue. Hoping to help out the next fellow riders exploring this area. Pictures attached. 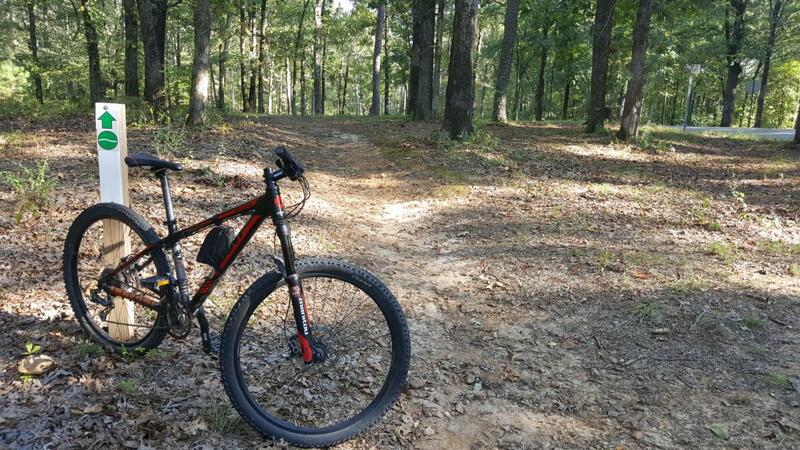 Craighead Forest Park MTB Trail 4.00 out of 5 based on 1 ratings. 1 user reviews.